Is Amazon Building a Kindle Smartphone? It was almost a year ago that we listened to all those rumors about an upcoming color Kindle from Amazon. When Amazon finally announced the Kindle Fire this September, everyone already knew what to expect — an iPad-style tablet with a touchscreen that could also play videos. Now a few months later, there’s a brand new rumor in town. 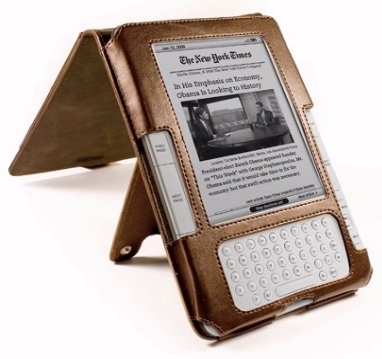 The next Kindle-riffic device coming from Amazon may be a smartphone! “Amazon will try to compete on price, like it does with the Fire,” reports one business analyst, suggesting Amazon could reduce the smartphone’s price until they’re just breaking even. Amazon would produce smartphones for around $170 — and then try to earn money by selling “media” (like music files, videos, apps, and of course, ebooks). The device would be cheaper than “high-end” phones, but Amazon still faces a lot of competition. “This seems totally crazy,” responds a technology reporter in San Francisco. “Amazon doesn’t do anything significantly better than other smartphone vendors…” But Amazon’s mastered the art of selling, and they’ve fine-tuned it over more than a decade. So the reporter also identifies what may be Amazon’s secret weapon: they know all about your shopping habits. “If you’re an Amazon customer, it knows what you buy, when you bought it, who you bought it for, and how often you return. It also has a bunch of other customer buying habits which it could use to predict what you might be interested in.” Instead of just selling media files from Amazon’s web site, Amazon could sell you real-world items from the stores in your neighborhood. And because they know your purchasing patterns, Amazon could tie the “special offers” to your known interests – and, to your location! The phones could include a “digital wallet” that’s tied to your Amazon account, the reporter speculates, which might communicate with a special Amazon kiosk that retailers could install, taking e-commerce off the web, and creating “mobile commerce”. (Like the Kindle Fire tablet, it’s not just a handheld device – it’s also a shopping platform!) And the reporter also points out that Amazon has already invested in “Living Social”, a service which offers Daily Deals to share among your digital friends. Could Amazon tie this all together into a new way to shop? I’m excited about the possibility, but for an entirely different reason. I’ve always wanted a Kindle “Mini” — an iPod-sized screen that just displays ebooks, so the cost still stays nice and low. I like using the Kindle app on my smartphone, because then there’s always something for me to read waiting in my pocket. It almost feels like a “cute” technology – reading ebooks on an adorable miniature screen. 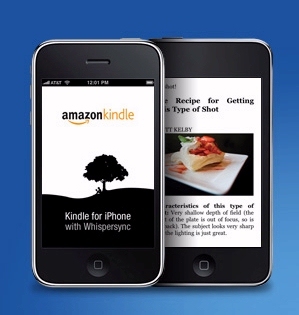 Amazon’s probably realized that a lot of people are already reading their Kindle books with a smartphone app. The only question now may be what to call Amazon’s new Kindle phone. The KPhone? The Phindle? Which eBooks Were Amazon’s Best-Sellers for 2011?